This is in fact, a six different maps of Scotland, superimposed on each other. It was compiled by John Cowley in 1734 to demonstrate the variance between the maps available at the time, caused by clock and chronometers used by mapmakers speeding up and slowing down, by inaccurate measuring devices and by human error. These variances are not enough to make Scotland unrecognizable. Indeed, any one of these six maps would make a great centerpiece on the wall in your study. But during the Jacobite Rebellion, the deficiencies of available maps caused huge frustration for the Hanoverian troops. In Rachel Hewitt's book Map of a Nation, she references correspondence from a Major General John Campbell, who commented "By the Map of the country it appears very easy & a short cutt to cross over from Appin by the end of Lismore to Strontian. [...] I have had [the route] viewed and it is impracticable in every respect". Hewitt confirms that the reality was that the route required island-hopping across Loch Linnhe, followed by a lengthy pathless scramble over steep rocky overhangs and mountain streams. The challenges that the Jacobites faced when they tried to navigate Scotland are similar to the challenges individuals in our organizations can find when they attempt to traverse our rivers of data and mountains of process. Differences of opinion on where a process should apply and which source is the most accurate can cause massive delays and detours. In some cases, it can result in massive delays as projects that once seemed simple turn out to be “impractical in every respect”. What do PMO People and Cartographers have in common? As it turns out, PMO people and Cartographers have a lot in common. Both have a desire to provide an accurate view of the landscape. In PMO-land, we often refer to this as being a 'source of truth' or 'voice of truth'. In the same way that PMOs seek to draw out the important stories or salient facts from projects to help the business understand them, Cartographers help explain what is happening in a landscape. Maps help explorers navigate complex terrain with relative ease, whilst allowing them to avoid obstacles along the way. PMO teams and Cartographers often seek to inspire and generate interest. The Eagle map below was created in 1833 and makes sense of the United States whilst drawing parallels with the US National bird, the Eagle. Similarly, PMOs work to help employees make sense of the projects portfolio, and how it aligns to an organization's vision, mission and brand. 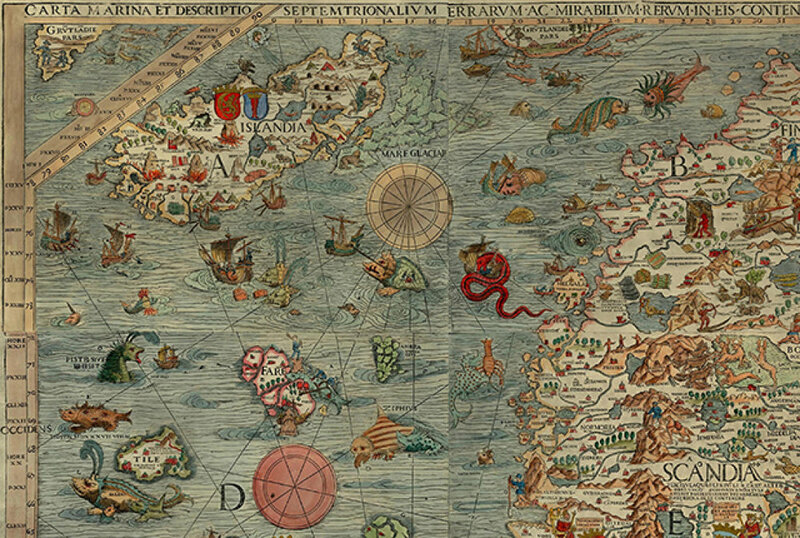 What can we learn from Cartography? On my wall at home, I have a nineteenth century map of the African continent. It features a dramatic mountain range called The Mountains of Kong. The range stretches from Upper Guinea to Soudan. My map is not especially unique. There were at least 40 map-makers of the time who diligently documented the Mountains of Kong in their maps and atlases. What is odd is that the Mountains of Kong do not actually exist. Indeed, they never have. The mountain range first appeared on a map in 1798. The map itself was based on the explorations of Mungo Park and was produced by map maker James Rennell. Mungo Park's expedition never ventured into the area where the mountains are shown, so it is unclear as to how they came to appear on the map. However, in a world without aircraft, satellite images and Google Earth, the existence of The Mountains of Kong was not questioned. As further expeditions into Africa and the Niger basin reported back, cartographers created maps based on their journeys and discoveries. But despite none of the explorers actually seeing the massive mountain range spanning the continent, their existence was unchallenged for almost a century. Map makers continued to include the Mountains of Kong, based on the work of earlier cartographers. It took until 1887, when a French explorer Louis Binger spent two years charting the River Niger for the existence of the mountain range to be discredited, and they quietly disappeared from subsequent maps of the region. The lesson that PMOs can draw from the Mountains of Kong episode is that assumptions and accepted truths should be challenged and verified before being relied on. For Projects, this means ensuring assumptions are called out explicitly and validated early in the project. Depending on the nature of the assumption, this could mean anything from verifying the cost of materials to running 'Proof of Concept' (POC) events to validate expected outcomes. The PMO itself is not immune to such mountainous mistakes. There is an implicit assumption in all PMOs that the Projects Selection approach and Projects Delivery Frameworks reduce risk to the organization whilst delivering decent returns on investment. But too often these assumptions are not based on empirical data. PMOs should regularly review their processes and procedures and validate that they genuinely deliver the value that is expected of them. If you cannot evidence the value a process brings to the table, maybe it is based on a false assumption. The lack of evidence could be a good indicator that you need to embark on a PMO Process Purge. One of the things that frequently draws observers to old maps is the inclusion of mythical and fabulous beasts. In medieval times, much of the world remained unknown and unexplored. For Cartographers, this gave rise to a common dilemma. Leaving the area blank was unattractive and could confuse viewers, who may mistake the area for empty sea or desert. Instead of letting the known world blur into blank space, cartographers opted to include ornate and scary creatures to infer that they didn't actually know what was out there, but whatever it was might be a little bit dangerous! Here in the murky world of biblical creatures and sea-monsters lurk lessons for the observant PMO Manager. Where are the monsters in your portfolio? In every PMO I have worked in, there are areas that are uncharted and occasionally even taboo. They lurk at the boundaries of the PMO sphere of influence and between the swim-lanes of process. These areas deserve greater attention and scrutiny. When Cartographers reached the limits of geographic knowledge, they warned of the dangers that may exist. Similarly PMOs should also call out the risks to the organization. In fact, PMOs often have an advantage over medieval map makers. The PMO can organize its own expeditions into these metaphorical uncharted waters, map them and tame the sea-creatures within. By doing so, they make projects easier and safer for Project Managers. By creating clear processes that help project managers navigate the business, the PMO is acting as a catalyst, making it faster and safer for the organization to get things done. So far, we have focused on how Cartographers map geography. But that's not all they map. 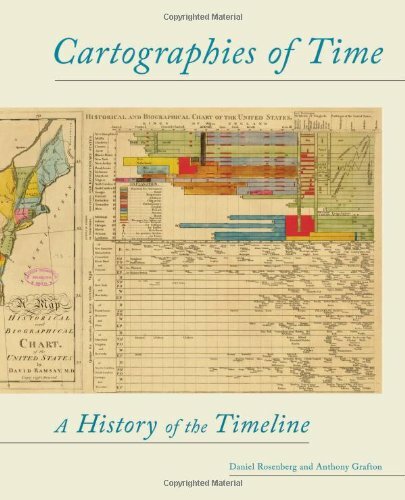 In their book, Cartographies of Time, Daniel Rosenberg and Anthony Grafton explore the evolution and the significance of graphic representations of time both in history and in contemporary culture. The book contains a number inspirations for PMO professionals struggling to represent project progress visually. Whilst the majority may by impractical to include in your weekly highlight reports, Cartographies of Time provides some great examples to counterpoint the ubiquitous Gantt charts, burndown charts and tables of milestones. Earlier in this article, I spoke of a desire to create an accurate view of the landscape or project portfolio. But what does that really mean? To create a truly accurate view of a project, we would need to include not just the metrics for time, cost and quality, but we would need to talk about how the team are feeling. More than that, we'd need to include all the interactions that occurred, every building block that was created (and indeed, every building block that was discarded). A truly accurate view of the portfolio would be as big and as complex as the portfolio itself. This was a challenge for map-makers too. Harry Beck, was an English technical draughtsman who is famous for creating the London Underground Tube map. Whilst previous maps of the London underground existed, they were based on geography. This lead to stations being bunched together in the center of London, making it difficult to see interchanges and plan routes. Beck took a different approach and drew up an alternative diagram in his spare time while working as an engineering draftsman at the London Underground Signals Office. Rather than emphasizing distance and geographical accuracy, like other maps, Beck based his on the circuit diagrams he drew for his day job; stripping the sprawling Tube network down to a neat diagram of coloured, criss-crossing lines. The resultant map was a huge success, and variants remain in use to this day, not just in London, but around the world. What made it so successful was Beck's ability to focus on communicating the important information that travelers needed. Part science, part art - this skill of translating the 'bigger picture' down to salient and relevant information that can be communicated effectively is without doubt the most important lesson that today's PMO Professionals can learn from Cartographers.